This name derives from the Hebrew "sh'ma alohim > sh'ma 'êl > shemû'êl", meaning “his name is God, his name is El, The one who listens to God, God has heard”. Elohim is a grammatically plural noun for "gods" or "deity" in Biblical Hebrew. In Modern Hebrew it is often referred to in the singular, despite the “-im” ending that denotes plural masculine nouns in Hebrew. It is generally thought that Elohim is a formation from “eloah”, the latter being an expanded form of the Northwest Semitic noun “il (ʾēl)”. This is a name of Biblical tradition, and one of two books of the Old Testament and the Hebrew Tanakh. As a Christian name, Samuel came into common use after the Protestant Reformation. Famous bearers include the American inventor Samuel Morse (1791–1872), the Irish writer Samuel Beckett (1906–89) and the American author Samuel Clemens (1835–1910), who wrote under the pen name Mark Twain. In the Old Testament is used by Samuel, prophet and last of the Judges of Israel. 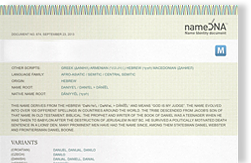 The name Samuel is given to different characters in the Bible: 1) Son of Elkanah by his wife Hannah and judge or prophet of Israel during the days of Saul and David. 2) Son of Ammihud, spelled 'Shemuel', and the prince of the tribe of Simeon who was chosen to divide the land of Canaan between the tribes. 3) Son of Tola and grandson of Issachar, also spelled 'Shemuel'.